As I planned our trip to Thailand, I dreamt of elephants and papaya salad and how to return home feeling strong. 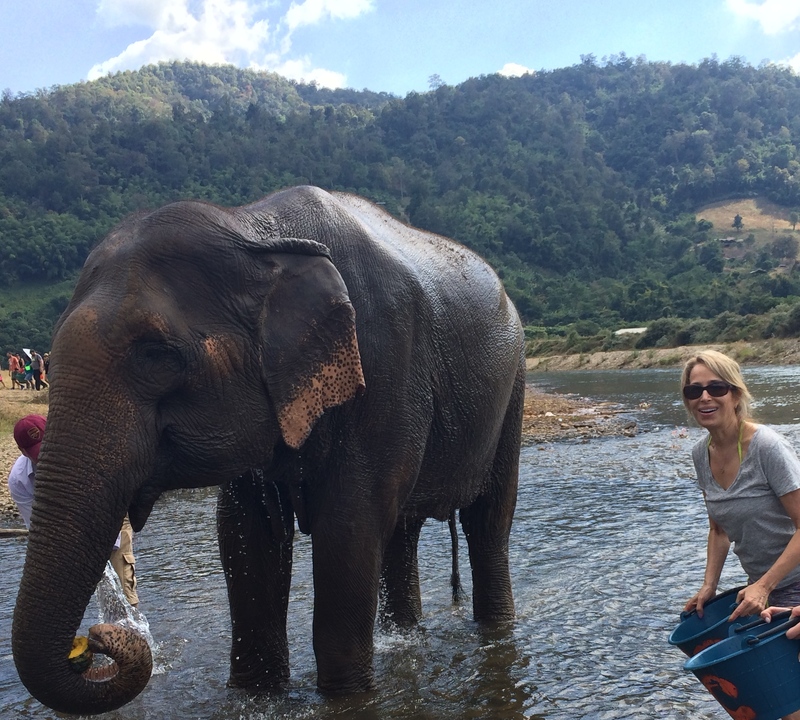 We visited the islands of the south, Bangkok, and the northern hills and I am happy to share that I bathed elephants in the river, learned to prepare Thai curries, visited ancient temples, danced at the royal palace, and fit my workout and nutritional program into my daily travel routine. With just a few key pieces of pre-travel preparation, I was able to bring my fitness routine on the road and stay strong and energized throughout our trip. I looked for a mat that would fit inside my backpack. Even the smallest mat would take a significant percentage of my packing real estate, but I was determined to save my knees and back from potentially hard floors and maintain peace of mind if faced with questionable carpets. After reading reviews, I purchased the Khataland’s YoFoMat® because it easily folds and fits into a case that would protect the clothing in my backpack from debris. I found the mat to be soft and provide great floor coverage and acceptable cushioning. At 72”, the mat was long enough to double for extra cushioning during kneeling work. I was happy to have opted to bring a mat even though it meant bringing fewer clothes! I thought it would be motivating to bring exercise videos, but most would not copy onto my computer. Enter Handbrake, a free open source video transcoder that easily copied some favorite videos that I own to my computer. From there I imported them into Apple’s ITunes so they could be synced with my phone or iPad. I enjoyed having some of my favorite TAM dance cardio workouts with me to balance out our Thai feasts! Having the videos downloaded was more reliable than trying to access them via YouTube when I found myself in hotels with inadequate or no Internet service. You can download Handbrake at www.handbrake.fr. I thought about bringing a set of hand weights in my backpack but decided that was going too far! 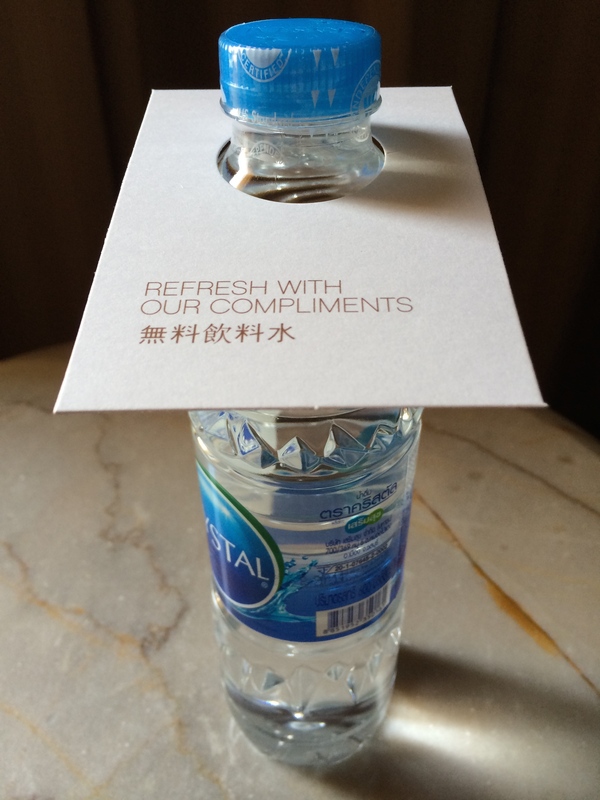 Instead I used water bottles from the hotel. Although they were at times lighter than the weights I use at home, I was able to work my arms sufficiently until we reached a hotel with a fitness center. Krabi Island in the south of Thailand was like paradise! I brought my workout outside so I could enjoy the fresh air and beautiful sights. 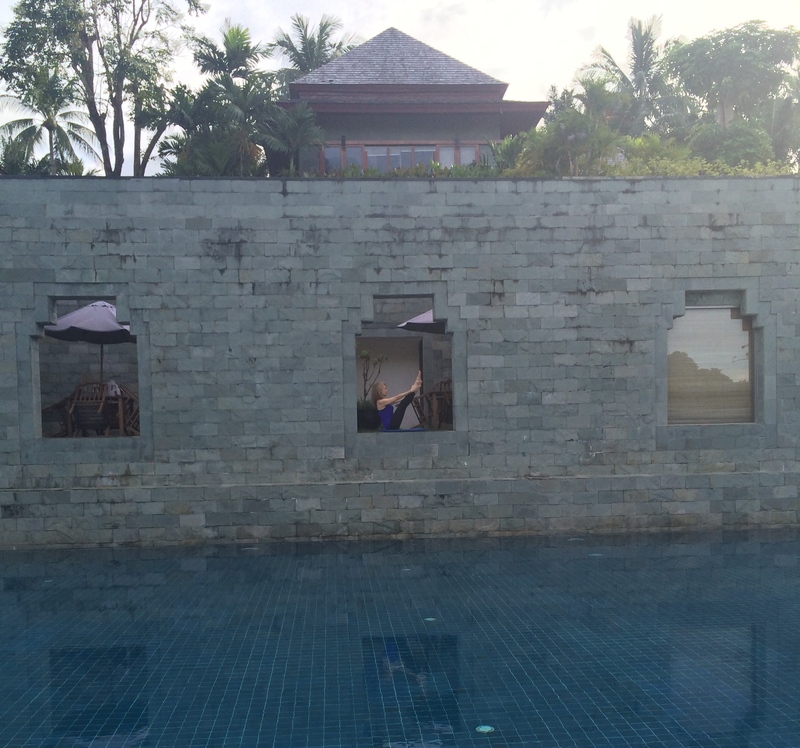 I used a cushion from a pool chair under my mat and did Pilates by the pool overlooking the Andaman Sea. The hotel fitness centers were well equipped. My favorite was Bangkok’s Sheraton Grande Sukhumvit. It has a nice gym with machines and cardio equipment and a dance studio where I was able to do my dance cardio in a large mirrored room by myself. Its fresh juice bar was the perfect way to replenish after a morning workout. I got my workouts done early in the morning so they did not interfere with family time. 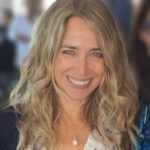 To keep my digestion running smoothly, I tried to be thoughtful about food pairing – when and how I ate certain foods. At home, I begin my day with a green smoothie to have an easily digested nutritious meal, but when that option wasn’t available, I looked for fresh green juices and fruits. For clear digestion, it is important to eat fruit on an empty stomach, so I even though the fruit was placed with the desserts on the breakfast buffets, I always ate the fruit first. I enjoyed whatever was fresh, such as pineapple, papaya, mango, banana and dragon fruit. If I was still hungry, the hotels were happy to make oatmeal with water, in lieu of the milk version available on the buffets. For lunch I enjoyed papaya salads and soups. It was easy to stay hydrated, drinking coconut water directly from fresh coconuts, ginger tea and lemongrass iced tea. Fresh coconuts made wonderful afternoon snacks. 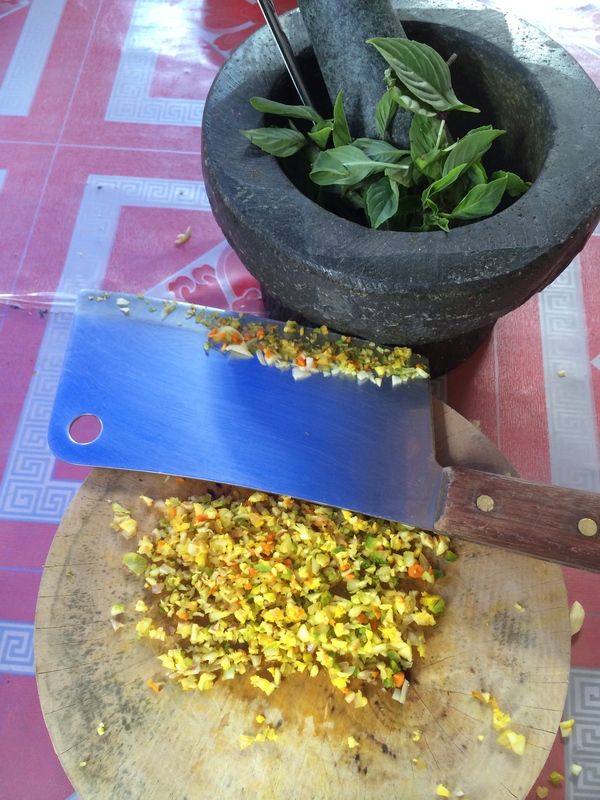 I love Thai curries, and at Siam Rice cooking school in Chaing Mai, we learned to grind our own curry pastes from fresh, natural ingredients. I look forward to making these fresh veggie curries at home, and avoiding the preservatives and unnatural ingredients found in store bought varieties. 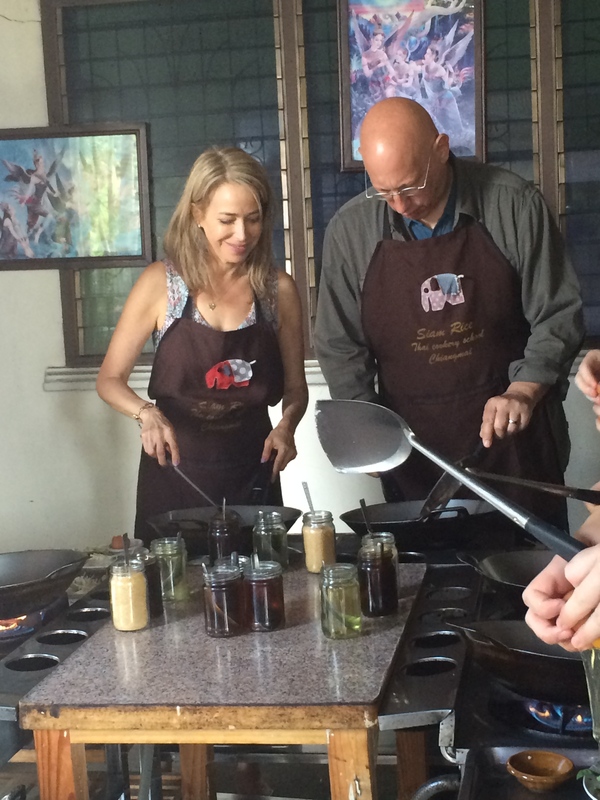 Taking cooking classes was a fun family activity and something we can do together when we return home! Wishing you safe & strong travels! Bathing elephants at The Elephant Nature Park, a sanctuary for rescuing abused elephants in the northern hills of Thailand. 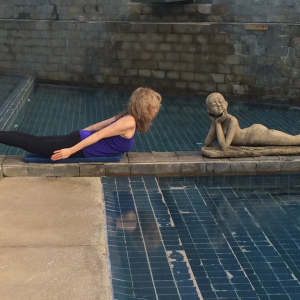 Love the pictures and the inspiration to stay fit and healthy no matter where one travels! What a wonderful experience this must have been for you and your family. Thanks for sharing! Julie – great blog…I’m going to look up the info you provided (for the mat and for handbrake)….thanks for doing all the research and making it easy for the rest of us. Looks like it was a wonderful trip. Thank you for sharing all of the information/photos from your amazing trip ~ and Inspiring all of us to remain healthy in our travels! Sounds like and amazing, healthy trip! Drinking coconut water from fresh coconuts! Great advice, especially taking exercise dvds on you iphone, I’m going to try this!